Cherries are one of the first Spring crops of the year. 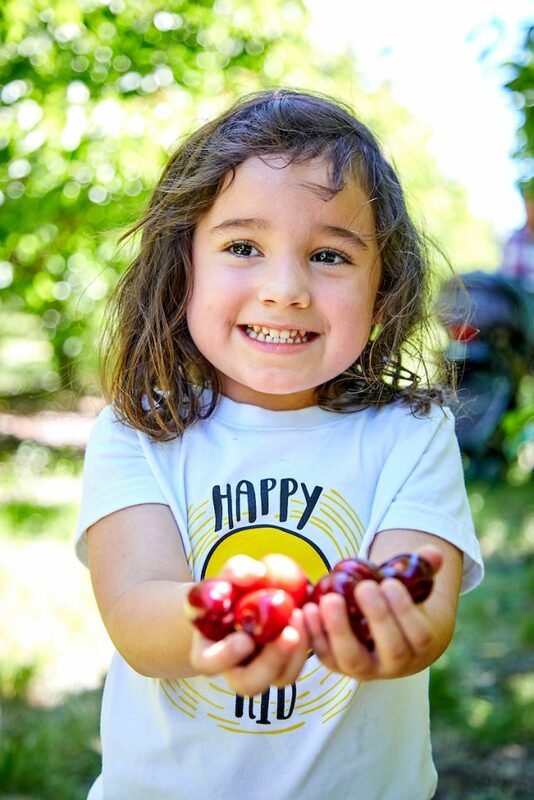 For Harvest Time in Brentwood, that means U-Pick season is about to begin where you get to pick cherries directly from a local cherry orchard. Today, if you drive through the outskirts of town, through the orchards, you will see gorgeous cherry blossoms spread throughout the landscape. This beautiful view is a sign that cherries will be here soon. 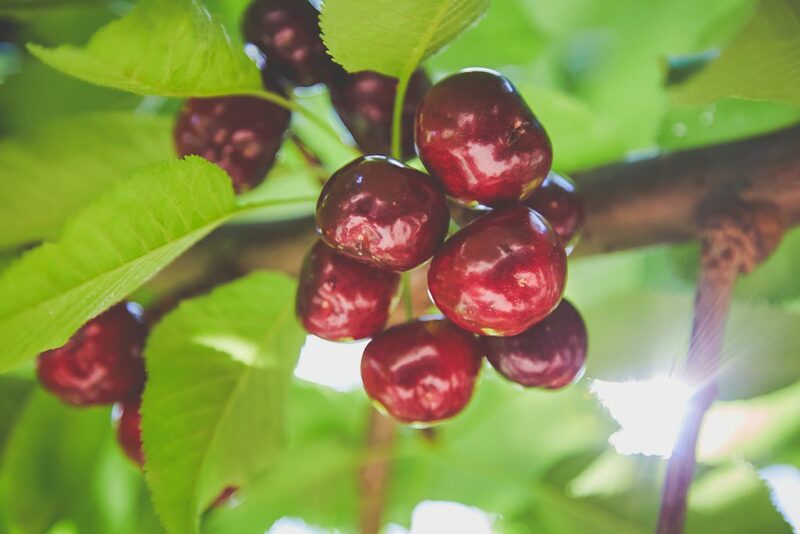 To get you ready for your cherry picking experience, here are some cherry picking tips that will help you get the juiciest, tastiest cherries of the season. There are many types of cherries. Most of our Harvest Time cherries tend to fall into the sweet cherry category. These are cherries that are best eaten fresh. The other genre of cherries are known as sour, or tart, cherries. These are cherries people prefer to use for baking or canning, such as in pies, jellies, and jams. When you hit our U-Pick farms, you will find an excellent variety of sweet cherries. Bing Cherry: The standard by which all other varieties are judged, Bing continues as the leading dark sweet cherry grown in the Western United States. Bing is also the No. 1 commercial sweet cherry sold in North America. The fruit is dark mahogany from its glossy skin to its dense, juicy flesh. It is exceptionally large and flavorful. Coral Cherry: A low-acid cherry with glossy dark flesh and a very sweet flavor that is similar to Bing. Fruits are firm and large to very large. It is precocious, heavy bearing, and will pollinate with Bing. Black Pearl Cherry: This variety bears black fruit that is firm, sweet, and split resistant. The cherries are good quality and store extremely well. Lapins Cherry: The most planted commercial black cherries in the West Coast. The flesh is sweet and juicy with good flavor. Lapins is a large, mahogany-red and lighter red flesh. EbonyPearl Cherry: Moderately firm and crunchy variety. EbonyPearl is dark red with excellent flavor and crack resistant. The stems are long and securely attached. Once you arrive at the cherry orchard, there are a few tips you should be aware of. First, cherries will increase in size until they are ripe. This means they should be picked when they are their maximum size. Cherries will not ripen off the tree. This means, if you pick a green cherry – it is not ripe and it will never be ripe. Look for full bodies and boldly colored cherries to pick. You can tell when the cherry is ready to be picked because sweet cherries are firm when they are ripe. Expect the stems to stay attached when you pick it from a tree. If you plan on eating the cherry immediately, grab the cherry without the stem. If you think the cherries may last a day or two, keep the stem attached for longer storage. Although cherry picking may seem to be simple, there are some tips that ensure your perfect find stays perfect off the tree. First, gently grasp the berry with your forefinger and thumb. Second, tug gently. Cherries that are ripe, and ready to be picked, will easily slide off the tree, with the stem attached. Cherries that are still not quite ready, will be resistant. Some people describe cherry picking like turning on a light-switch. Gently pull up and the cherry and stem will pull off easily. Do not pull as it might damage the tree and disrupt future growth. Finally, gently set the cherries into the container you brought to collect your berries. If you throw or drop, your cherries into the bucket, chances are good you will bruise or damage the fruit before you can eat it. Definitely, do not push and pack your cherries into the container to fit more in. Cherries are fragile. If you put pressure on them, they will burst and you will be left with nothing but a mess. Regardless of how long the trip home is, take some steps to ensure the sweet cherries you meticulously picked remain in prime condition for eating when you get home. First, keep your cherries cool. Make sure your freshly picked cherries stay out of direct sunlight. It is best to place them under the shade of a tree while you finishing picking. For the drive home, place your cherries carefully in the trunk of your car. It is also a good idea to bring a cooler with some ice. Keeping your cherries cool will help them stay fresher, longer. Only wash what the cherries you eat. When you get home, wash them right before you eat them instead of washing them all at once. This also preserves the cherries for longer storage. For longer storage, refrigerate them instead of leaving them on the counter. Cherry season is a perfect time to visit local Harvest Time Farms and Orchards. The spring brings forth a huge variety of fresh fruits and vegetables. Cherry season is short. Make your plans to visit a U-PIck farm early in the morning and early in the season, to ensure you get the tastiest, juiciest U-Pick cherries of the season. To get notified when cherry season starts, remember to sign-up for our newsletter!